KVH delivers higher data speed, greater Internet range offshore with its new TracPhone LTE-1. Everyone wants to stay connected these days, and while regular cellphone coverage continues to get better and more reliable, those who head 20-miles offshore quickly find themselves out of range. Realizing that even coastal cruisers want to stay in touch, KVH, one of the leaders in marine communications technology, launched the TracPhone LTE-1. Unlike the satellite communications technology that is the bedrock of KVH's business, TracPhone LTE-1 is a cellular product, which the manufacturer says will keep you connected up to 20 miles offshore. 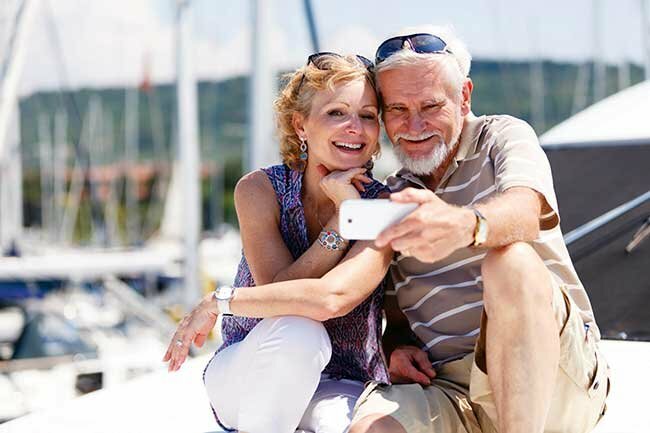 "The TracPhone LTE-1 is a game changer for boaters who want to stay connected with HD streaming, video chatting, and more," says Martin Kits van Heyningen, KVH's chief executive officer. "We've taken the same end-to-end approach we use with our satellite-based products to ensure the best experience for our customers by providing everything they need — from hardware to airtime — to enjoy fast Internet access on the boat." The outward appearance of the LTE-1 is the familiar KVH dome, albeit in a smaller package that measures just over 12 inches in height and width, so it should be an easy, unobtrusive fit on almost any boat. Under the hood are dual antennas, modem, GPS, and Wi-Fi router so you won't clutter up in the inside of the boat with hardware. Drilling holes through cored decking without taking the proper precautions is asking for trouble. Leaky lifeline-stanchion mounting bolts, (most likely due to failed caulking) have allowed water to enter the cored decking beneath. The mounting nuts are drawn so tightly they're crushing the panel, no doubt an attempt by the owner to not only keep the stanchion from wiggling, but also to try and stop the leak (note the inadequately sized washers and lack of a backing plate). No backing plate, nuts tightened too far, and incorrectly sized washers are all leading to a leaky lifeline stanchion, right. The photo on the left shows how it should be done. In a perfect world, your boat's manufacturer has anticipated where all deck penetrations are necessary and has "de-cored" these areas by reverting to solid fiberglass, allowing you to mount hardware without drilling into the core. But in the case of new installations, your chances are slim to none that any of these areas will coincide with whatever aftermarket doodad you want to mount, meaning you're going to have to do it the hard way. Anytime you screw or drill through a cored panel, the first rule is properly sealing the core against moisture entry. "Haloing" of bottom paint is sometimes observed on boats with bonding systems that are in poor condition or are providing overprotection of the bronze components. 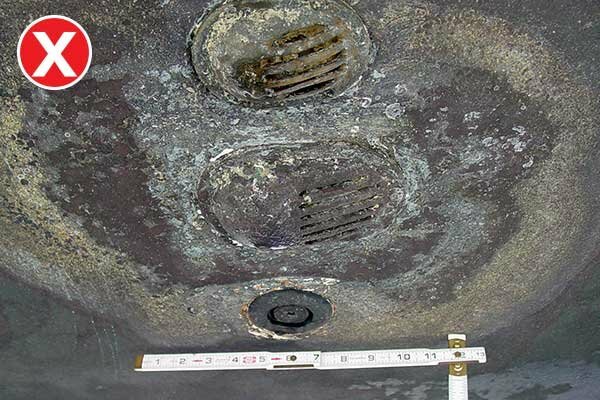 It's most prevalent with vessels using black or other dark-colored bottom paint and is more common with certain brands containing higher amounts of copper. 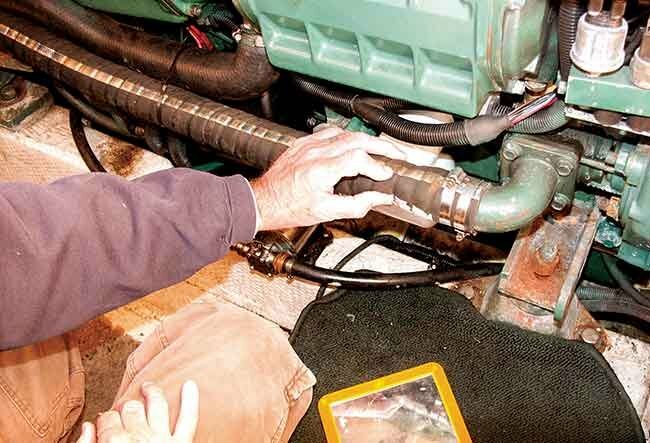 If found on your boat, inspect your bonding system connections (if you have one) to ensure they are clean, tight, and corrosion free. Another good idea is to conduct a corrosion survey to ensure proper galvanic protection is being provided. GPS - DO YOU NEED IT ON YOUR BOAT? Boating Electronics: Do I Need GPS? Hear what Capt. Scott Manning has to say. An experienced skipper thinks that no matter which fishfinder you choose, it should really have GPS and 2-D sonar. One morning I headed my boat downstream on a short 4-mile run to my fishing destination. About a mile into the trip, the fog rolled in so heavy I could no longer see. No amount of training, no spotlight, or any device I had on my trailer-sized boat could assist in increasing my visibility. Literally, I couldn't see the bank, the water in front of me, or more important, any oncoming boats or water hazards. I stopped my boat and immediately turned my fishfinder on GPS mode. This allowed me to see exactly where I was, where navigable markers were located, what the water depth was, and how close to the bank my boat was traveling. I was able to maneuver to a safe location until the fog dissipated. I then continued to my destination at a safe speed while appreciating today's modern technology. An essential part of any boat is electronics, which are used in locating fish, determining GPS coordinates, and numerous other applications. In today's market, boaters are overwhelmed with many brands and types of fishfinders. Boating and fishing have embraced 21st-century technology, turning the art of finding fish into modern-day science. These powerful tools allow the resources to check depth, structure, fish locations, speed, and temperature. 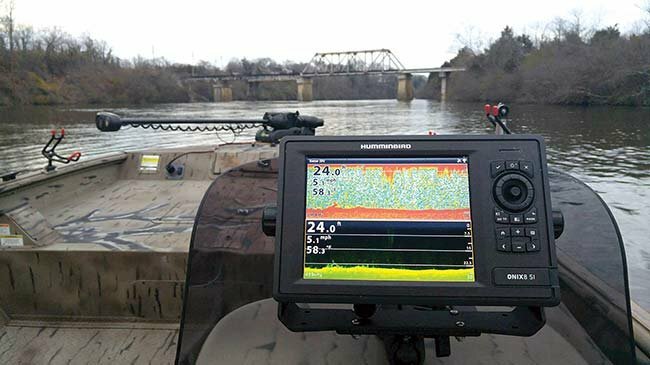 Humminbird, Lowrance, Raymarine, and Garmin are the main producers of fishing electronics, and all have their pros and cons. The biggest mistake is to purchase a fishfinder without GPS. GPS stands for Global Positioning System and receives signals from government satellites to determine your exact location. GPS not only allows you to track your course and create mapping of favorite fishing spots, structure, and water hazards, it could also save your life. Most GPS units come with pre-installed maps. To obtain more detailed and updated GPS data, however, invest in a Lakemaster or Navionics SD card. Also, GPS gives latitude/longitude coordinates that can be added to your float plan or pinpoint your location in case of an emergency. Venturing out too far in the sea or large bodies of water can spell disaster if you get lost and can't find your way back to shore. GPS tracking adds an extra layer of security by tracking your route and recalling the location of your boat. GPS offers endless possibilities for recreational and angling boaters. Modern GPS technology has the ability to network with radar, sonar, trolling motor, and autopilot systems. GPS will give you more confidence to explore and make the most of your time on the water. I use a Humminbird Onix with side imaging. This is the top-of-line unit that comes with GPS, 2-D CHIRP sonar, down imaging, and side imaging. The capability to uncover structure and cover with these units is incredible. Whichever unit you choose, make sure it has GPS and 2-D sonar. A fishfinder is an essential part of any boat and an excellent investment. The higher-end models can be expensive, but the added benefits outweigh the additional cost, provide additional safety features, and maintain value. How you handle choppy water is a skill that you need to develop if you want to enjoy boating. This article, which I found, covers the basics of boating safely through chop. Many boats handle choppy water different, so know your boat type. Power boats are designed with rough water in mind. Hull designs such as the deep V and even double hulls have made choppy waters less of a problem, but the burden is on the captain, that's you, to get it right. Well designed boats are half the equation; the other half is you. 1. Batten down. No matter how skillfully you maneuver your boat, if loose equipment and just plain stuff litters the boat you may be in for an expensive experience, not to mention danger. 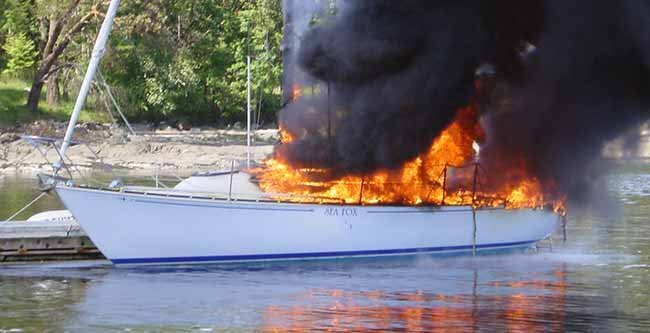 Debris flying around a boat can damage the vessel and injure the people aboard. Simply stowing things into compartments is a good first step. Some experienced boaters keep a few old towels aboard as stuffing material to keep things in place. Of course there are some Items that you need to keep handy such as binoculars. Velcro fasteners are a great way to keep these things in place. It almost seems that the Velcro people make this stuff for boating. Good seamanship dictates that you prepare your vessel for rough water even when things are calm. Boats should be ready for the water to turn to chop. 2. Watch your speed. Power boats can go very fast, but sea conditions may dictate the you go slowly. Handling power boats in chop requires careful use of the throttle—and a lot of common sense. There is no clear cut definition of when water turns from chop to just plain rough. In a choppy sea you may not encounter waves that come in regular intervals, just a mess of little waves that don't seem to go anywhere. In a chop you want to add speed; in a rough sea with large waves you want to go slow. If you have a planing hull, that is one that enables your boat to skip or plane across the surface of the water, you should "get up on plane." Planing enables the boat to avoid the worst effects of the chop and can deliver a smoother ride than going slow. Boats without planing hulls, such as trawlers, have it a little tougher. If your boat doesn't plane you handle chop by just gutting through it. This isn't as bad as it sounds because a displacement hull is designed for stability. If the chop turns to heavy waves, slow down. You can't plane along the surface of eight foot waves at 20 foot intervals. You can kill yourself. Boating through chop, like most things in boating, requires a strong dose of common sense. 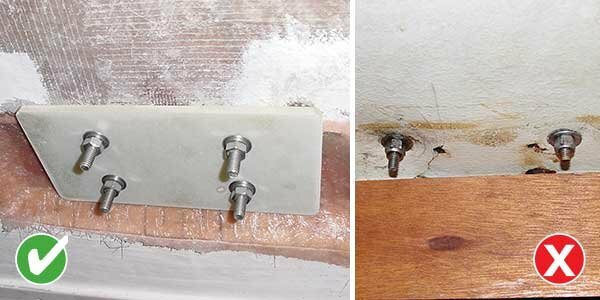 A leak around deck hardware is not only annoying, it is probably damaging your boat. With today's effective sealants, making deck hardware watertight is not all that difficult. Here's an excerpt from an article from Don Casey to help you avoid a costly repair. Most decked boats are constructed with a wooden core in the deck to stiffen it. Smaller powerboats use a similar construction technique for the transom. If water is allowed to penetrate, rot in the core is the usual consequence. Repairing saturated or rotten core is a very big job, the cost often exceeding the value of the boat. More boats "die" from core problems than from any other single cause. Water would never reach the wood core if we didn't drill holes in the deck (and transom) to mount hardware items. But we do, and as good as marine sealants are, it is a high-stakes gamble to depend on them to keep water out of the core. Anytime you bore or cut a hole in the deck, seal the exposed core with epoxy before mounting any hardware. If you are rebedding old hardware, be certain that the core has been properly sealed, or follow this procedure before reinstalling the fitting. Drill all fastener holes oversize. It isn't necessary to oversize cutouts. Remove all core within 1/4" of the hole or cutout. A bent nail chucked into a power drill is an efficient tool for chipping out the core. Vacuum the pulverized core material from the cavity. Whatever you can't remove will act as a filler. Saturate the exposed core with epoxy. On horizontal surfaces, seal the bottom of the hole with duct tape and pour catalyzed epoxy into the top. When the cavity is full, allow a minute or two for the unthickened epoxy to saturate the core, then puncture the tape and let the epoxy run out back into your glue container. For vertical surfaces you will have to inject the epoxy into fastener holes. Use a brush to "paint" the core around cutouts. Mix colloidal silica into the epoxy (the same epoxy you have already poured through the holes) to thicken it to a mayonnaise consistency--stiffer for holes in vertical surfaces. Retape the bottoms and fill each cavity level with the deck. Allow the filler to cure fully, then redrill the mounting holes through the cured epoxy. Sand and clean the area that will be under the fitting and you are ready to bed the hardware as detailed above.